You can see my previous post on the exterior of Fyvie Castle here. 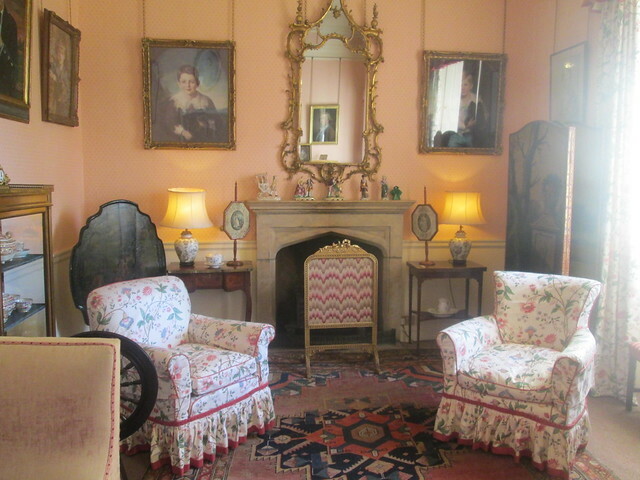 Below is a photo of a drawing room, I think it’s comfy looking, not too grand if you’re used to old places and furniture. The photo below is much brighter though and this is the family room, I imagine that the ladies of the house used this one most of the time for relaxing, reading and sewing in, note the small face screens on the side table by the fireplace, used to stop the heat from the fire from damaging their complexions. 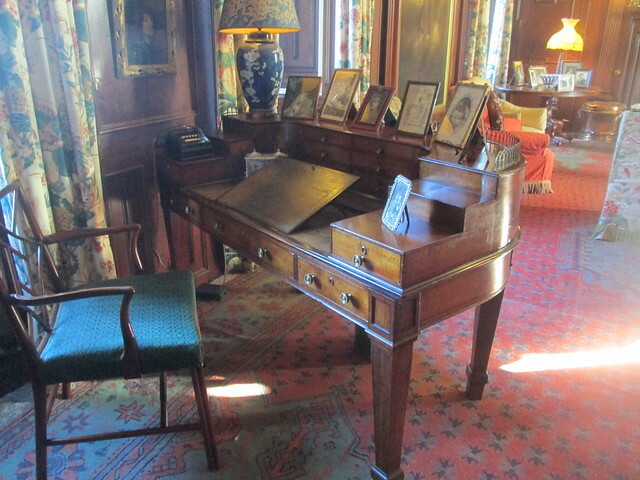 Below is a very solid looking desk, a proper work desk, not one for ladies to write their letters on I suspect. 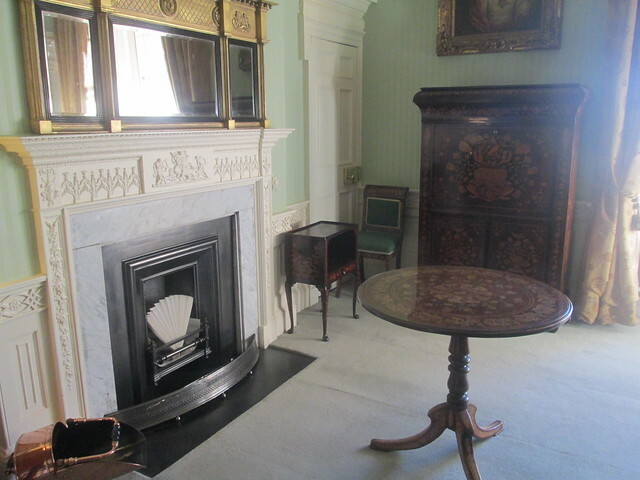 If fireplaces are your thing then there are plenty to choose from in Fyvie, the furniture looks Dutch to me but I’m sure that wasn’t what the guide said it was. They were preparing for a wedding while we were there, hence the chairs in the photo below, so I had to be quick taking it. While we were ay Fyvie there were quite a lot of really small children there with their parents. One four year old French girl was diving around the place like it was a school playground. According to one of the guides this is normal behaviour for many families – and the parents just let the kids get on and do what they want, picking up objects and jumping on chairs. I thought it was bad enough when they allow kids to do things like that in IKEA! I feared for the Tiffany lamp at one point and was also worried that people might think I was with the child as there were no parents in sight. 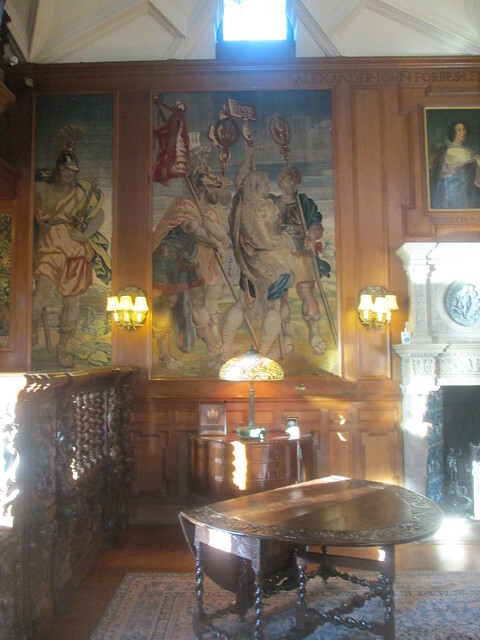 The Tiffany lamp is in the middle of the chest of drawers, underneath the tapestry, sadly you can’t see its intricate design well in this photo. 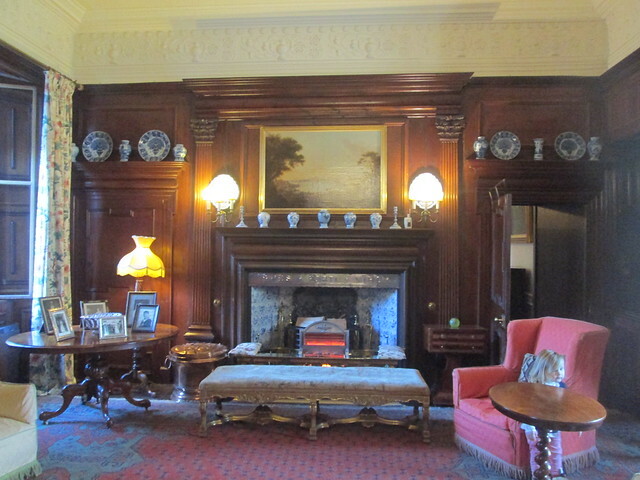 The day we visited Fyvie Castle it was very hot, I was saying – is it me, or is it really hot? Later that day the BBC weather chap said that Fyvie had been the hottest place in the UK, it was 19 celsius (66.2 F) I think, very hot for the end of October. Two days ago the weather man said that Fyvie was the coldest place in the UK at -7 celsius (19.4 F). I wonder if that was just a coincidence or if there’s something about the location that attracts weather extremes. I still have a lot of photos of the interior of the castle, but that’s enough for now. 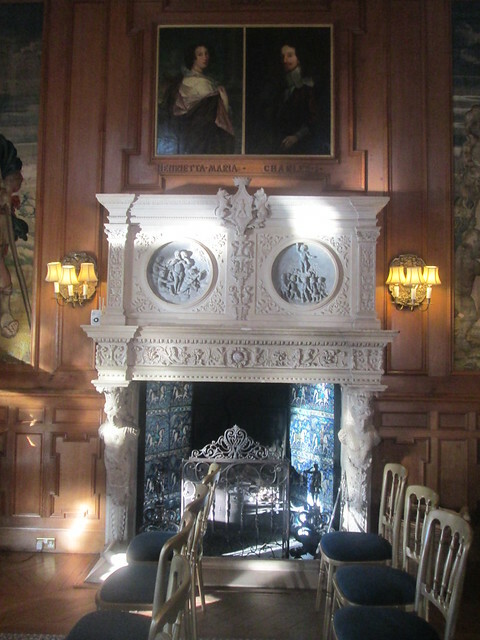 This entry was posted in Architecture, Scottish History and tagged antique furniture, Edwardian interior, Fyvie Castle, Tiffany by Katrina. Bookmark the permalink. What a lovely and comfortable looking house. I’ve seen those free-range children, too. At the beginning of the tour, I think the guides should tell parents with children that they will have to pay for any damages caused by their children, make it very clear. Or, if the children are left wild, the family should have to leave. No wonder the world is in such a situation! So few people are taught how to behave! I agree. I think this house doesn’t have enough guides, it’s difficult as I suspect that they are all volunteers and they can’t be everywhere. Some people seem to think that if they’ve paid for entry then they own the place while they’re there. I love that desk. Actually, the whole place seems so livable. Your photos look as if the occupants had just stepped away for a minute. That desk is lovely and has bits that pull out of it at the side to make extra shelves. I love furniture that ‘does’ things – metamorphic I suppose it’s called. 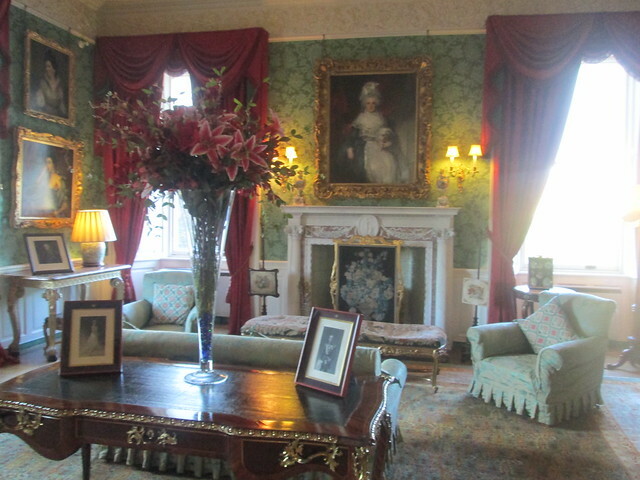 It does feel like the owners are still around, I think the flower displays help to give that atmosphere.